DigNittany: In the last DigNittany North Pole Poll before the NCAA Tournament, Stanford ranked #1, Penn State ranked #2, Texas ranked #3, and Oregon ranked #4 (if memory serves, you may have voted Oregon #7). Did the Ducks change your mind with their play against Nebraska, and if so, what were a few things about Oregon that impressed you more than you expected? Lionsfan: The Ducks certainly changed my mind (not that there was a big gap between most of those Top 7 teams), and they earned it the hard way: playing in perhaps the toughest environment in women’s collegiate volleyball. I had them pegged as the clear No. 2 in the Pac, so it shouldn’t be surprising that they are in the Final Four. But what impressed me so much was how assuredly they did it after dropping the first set 25-15, at which point, I thought Nebraska was going to coast to a three-set win. Winning in Lincoln and Omaha isn’t easy, and when you’ve already spotted the Huskers a set, that becomes even more daunting. That they were able to come back and win in convincing fashion (-22, -18, -17) is a testament to how dangerous this team is. If they can win in front of nearly 10,000 opposing fans in such a high-stakes game, they can win anywhere. I think that was the biggest question mark people had about the Ducks — everyone knew they had an amazing team, but the program hadn’t been in that kind of pressure environment before. Many thought the atmosphere could be too much and overcome them, but it wasn’t. This team is focused, ready and hungry. DigNittany: Oregon’s 5-9 Jr. S Lauren Plum was the 2012 Pac-12 Setter of the Year (and AVCA First Team All-American). From your observation, what are some of Plum’s strengths and weaknesses, and how does she compare overall to Penn State’s 5-11 So. 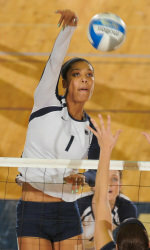 S Micha Hancock, who, somewhat coincidentally, was the Big Ten Setter of the Year (and also won AVCA First Team All-American honors)? Lionsfan: I haven’t seen nearly as much of Plum as I have of Hancock (you can blame Comcast in the DC area for that), so I can’t be as enlightening or illuminating as many other fans out there. But from the little I have seen, Plum seems to be more adept out-of-system and more unpredictable (in a good way) in-system. But that is also a credit to the great options she has. Plum has an extra year of experience under her hands, and I think that shows from a “setter” skill standpoint. Hancock has the power to singlehandedly impact the game and be a game-changer when things get tight. DigNittany: Another comparison — this one between two players who play different positions: Oregon’s 6-3 RS Sr. OH Alaina Bergsma, who was the Pac-12 Player of the Year (and an AVCA First Team All-American), totaled a match-high 23 kills against Nebraska (hitting .429, with only two errors in 49 attacks), and Penn State’s 6-4 Jr. Opp/RS Ariel Scott, who was the Big Ten Player of the Year (and an AVCA First Team All-American), and totaled 25 kills (.422 attack %) in Penn State’s Regional Final match against Minnesota. What do you like about each, and what do you think are their respective weaknesses? Lionsfan: It’s so interesting how nearly identical those numbers were for both of them during their Regional Final. It just goes to show you how impactful and important they are for their teams, carrying the workload as “go-to” hitters and keeping their teams on top. From what I’ve seen, Bergsma has more of an all-around game; while Scott has a blocking advantage, Bergsma averages more than twice as many digs/set (to go along with an extra kill per set and a higher hitting percentage). I wish we got to see more of Scott in the backrow, at least to hone an attack back there (something six-rotation players Deja McClendon and Megan Courtney have started to show off). But these players aren’t going to be the deciding factors; even if one or both of them has an “average” match, they are still going to be good enough to be a factor. It’s going to be the supporting casts that decide the outcome — for Penn State, that means 6-1 Jr. OH Deja McClendon and 6-2 Fr. OH Megan Courtney, both of whom had moments of brilliance and moments of frustration last weekend. If either or both of them can find and sustain an offensive fire, it would be an immense advantage. The middles and the backrow also will be key: 6-2 So. MH Nia Grant needs more kills than the one she had against Minnesota, and 6-6 Jr. MH Katie Slay needs more blocks than the one block assist she had against Minnesota. 5-6 So. L Dominique Gonzalez (20 digs against Minnesota) and 5-6 So. DS Lacey Fuller(7 digs against the Gophers) have quietly been doing their jobs and impressing me throughout the season. I expect both of them to be ready for the challenge. DigNittany: Final question – who wins, and why? Lionsfan: After the Regional Finals, I was scared by how good Oregon and Texas looked. Like, really scared. I figured it would take a super-human performance for either of them not to make the final. 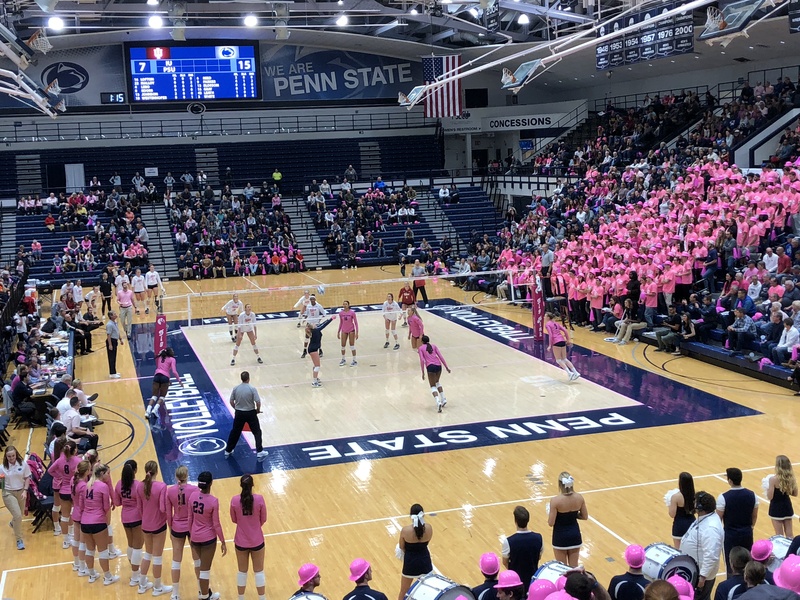 Penn State looked sketchy in spots, especially an 18-5 Gopher run in the second set (I’m sick just writing about it) that was agonizing to watch. Penn State can’t let that happen again (though to be fair, Oregon didn’t look so great after their first set, either). But the semis aren’t won last Saturday. Every match and every day is different, and teams match up with each other differently. It’s encouraging that Penn State won even showing some rough stretches of play, so if they can step up their game this could be a highly competitive match. The Lions needs to frustrate the Duck attack, and that means the blockers getting touches and the backcourt making the plays. 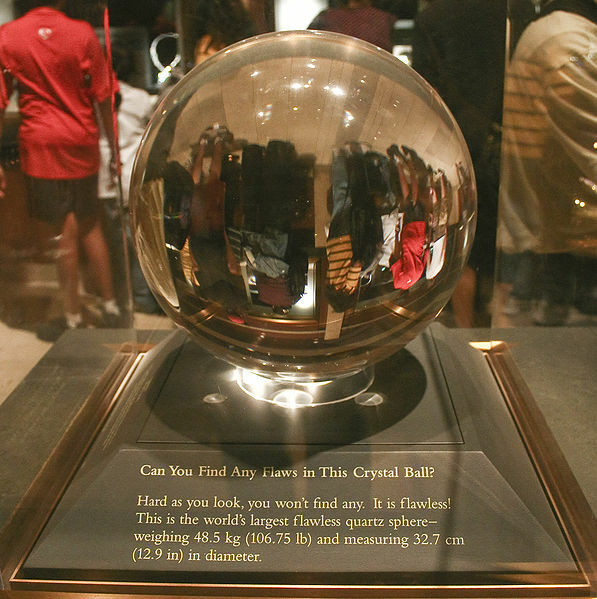 I’m curious to see if Coach Rose throws any new curveballs our way. After the way Oregon handled the nerves in Omaha, it’s hard to think that the “pressure of the moment” will be any greater on their side of the net. Still, Coach Rose and three of Penn State’s major contributors (McClendon, Scott and Slay) have Final Four experience, and from a coaching perspective I wouldn’t want anyone else calling the shots besides Rose. The venue might also favor the Lions, who played there earlier this year. Neither team will have a major crowd advantage, although I imagine the Lions will probably have a few more clappers in their corner (I’m curious to see if the Husker and Wolverine fans in attendance cheer for the conference). I hope the Lions vividly remember that homecourt-streak loss against the Ducks in Rec Hall in 2011, and use that as motivation . . . and I hope Rose has them as relaxed as I remember the commentators saying the 2007 team was when it arrived in Sacramento. But I don’t think any of those intangibles will ultimately matter. I just have a feeling about Oregon, who looks like they mean business. They have so many options and I think the Ducks pull it out, although I hope I’m wrong. DigNittany: It certainly should be a great match. But we’ll have to disagree with you on the outcome. Sure, Oregon is a great team, but so is Penn State. We’re going with the Nittany Lions, who have shown a resilience and determination this season that we think will give them the edge. Once again, thanks so much for your time . We really appreciate it and so do our readers.